Pet friendly Hebron, New Hampshire, is a beautiful New England town on the shores of Newfound Lake. Newfound Lake is the fourth largest lake in New Hampshire and one of the cleanest lakes in the world. Ragged and Tenny Mountain ski resorts are nearby and provide for winter ski amenities. 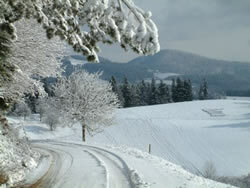 How about 100 miles of maintained snowmobile trails nearby! If you would rather venture out on foot, there are plenty of snowshoe and cross country trails as well. Outdoor warm weather activities abound in Hebron and the surrounding mountains and lakes include boating, swimming, skiing, hiking, riding, shopping, farms, fairs and festivals, museums, science centers, state parks, AMC trails, excellent hunting and fishing, and countless natural wonders. Audubon Centers allow for lots of exploring, and allow leashed dogs on their trails. Attractions nearby include Hanging Rock State Park, where the pet friendly hiking trails offer sheer cliffs and peaks of bare rock, quiet forests and cascading waterfalls, views of the piedmont plateau that stretch for miles. 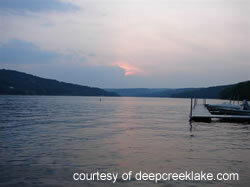 McHenry is located on the northern most shore of Maryland's largest fresh water lake, Deep Creek Lake. There are more than 69 miles of shoreline. Birdwatchers will enjoy the aquatic birds in and around the lake. 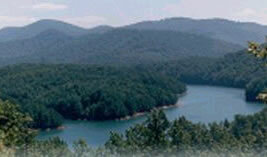 Fishing is a great attraction on this lake with catches including trout, bass, perch, crappie, bluegill, carp, and pike. Boating and swimming are other popular activities permitted. Pets are permitted in certain sections of the campsites, and also on the trails as long as they are on a leash. The trails range from moderate to difficult. Nearby, Wisp Ski Resort provides both summer golf adventures as well as winter sports with 132 acres of ski terrain. While you are visiting the area, don't miss the Western Maryland Railroad trip which runs from Cumberland to Frostburg. The splendor of the Allegheny Mountains can be enjoyed in the cabin of the train. Although only certified assistance dogs are allowed on the train, if you can arrange for a pet sitter, this is a beautiful ride through the Allegany Mountains. 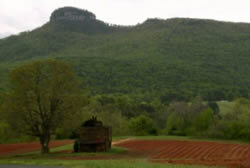 Ellijay, Georgia's official Apple Capital is nestled in the foothills of the vast Chattahoochee National Forest, part of the Appalachian Mountain Range. This popular, yet unspoiled mountain getaway is filled with natural beauty, deep emerald forests, cool, clear rivers and streams, peach and apple orchards, and an abundance of wildlife. There is lots of room to hike with your pet and they will be welcome on the streets of this beautiful community. Nearby Chattahoochee-Oconee National Forest offers hunting, fishing, camping, horseback riding, hiking, swimming and more. Pets are allowed on leashes except in swimming areas. If you are more inclined to browsing antique shops and enjoying a great meal, downtown Ellijay has all you need. This is apple country and in mid October, the annual Apple Festival, people come from everywhere to "celebrate the apple". These are just a few of the smaller towns on the east coast that await your visit and will welcome you and your pet. Discover a new place to relax and enjoy the beauty that our country has to offer with a small town experience.